If you are looking for holiday cheer and charm in December, SOMa’s got you covered starting this weekend with a variety of high quality events. 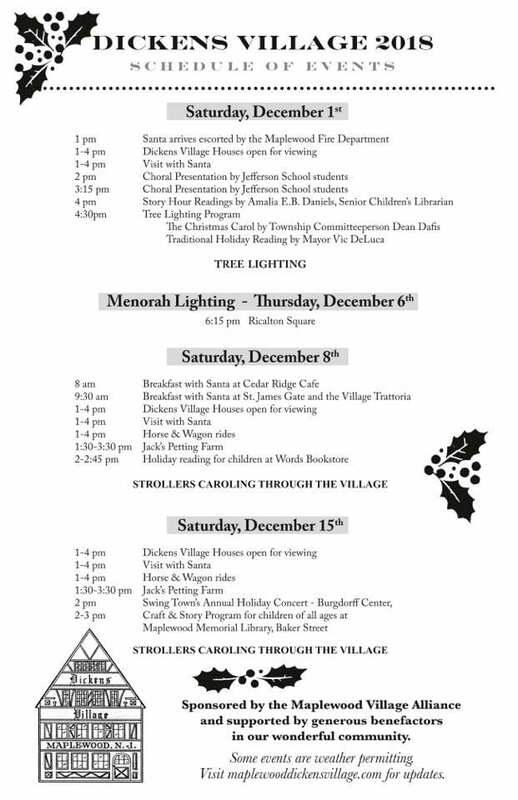 Dickens Village returns to Maplewood this Saturday December 1st, and continues through Saturday December 15th. The full schedule of events can be seen below. Tree Lighting Festivities are this Saturday at 4:30 and once again, The Lichtman Rabney Group is happy to be sponsoring the tree. This Sunday at sundown marks the beginning of Hanukkah and there will be a lighting of a Menorah in Spiotta Park in South Orange at 5:00. This event is co-sponsored by Congregations Beth El, Oheb Shalom and Sharey Tefilo-Israel with support from South Orange Village and Village Alliance. Menorah Lighting will take place in Ricalton Square in Maplewood on December 6th at 6:15. This is sponsored by The Maplewood Jewish Center. Interested in photos with Santa? You can enjoy that and more at the South Orange Firehouse on Saturday December 8th beginning at 1:30. Check out Hometown Holiday in South Orange. The Lichtman Rabney Group is happy to be a sponsor of this event again.